The annual juried exhibition of Indiana Artists, Inc. will be showcased in the Brett Waller Gallery on the lower level of the Indianapolis Museum of Art at Newfields. The Cecil B Head fund and Indiana Artists, Inc. will be awarding a total of $15,000. The award ceremony and business meeting will begin at 3pm in the DeBoest lecture hall (lower level) on Sunday April 7th. This prestigious exhibition runs through Saturday June 1st. Please join the party throughout the building and in my studio A335 where I will be showing many new works in all shapes, sizes, and color palettes. A sampling of paintings inspired by my recent trip to Spain will be available for purchase. Friday’s hours are 5-10:30pm and on Saturday you can enjoy the artist studios from 2-7pm. Remember, I’m in studio A335 which is the wing closest to 10th and Capitol. I will be working on oil paintings inspired by my recent trip to Spain! Annual Holiday Open House at the Stutz featuring holiday music, food venders with 40+ participating artists. 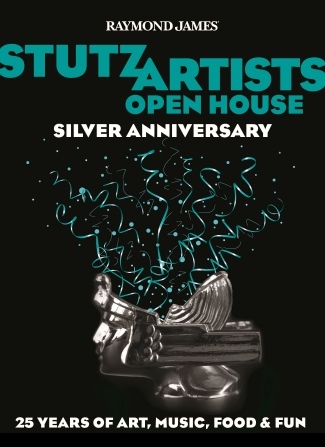 "The Stutz Silver Anniversary Open House"
Saturday continues with everything Friday offers, plus open studios, artist demonstrations, children's activities and guest speakers. Your ticket from Friday allows free entrance on Saturday from 2-7pm. Experience all kinds of art with 70+ artists studios open, a variety of music, entertainment, food and beverages throughout the building. "The Stutz Silver Anniversary Open House VIP event"
Over 25 of my original oil paintings will fill ( and bubble over ) the Harrison Center's main gallery the entire month of April.